Riding a bicycle isn’t too technical, but if you plan on being a regular cyclist than you’ll need to learn a few hand signals. 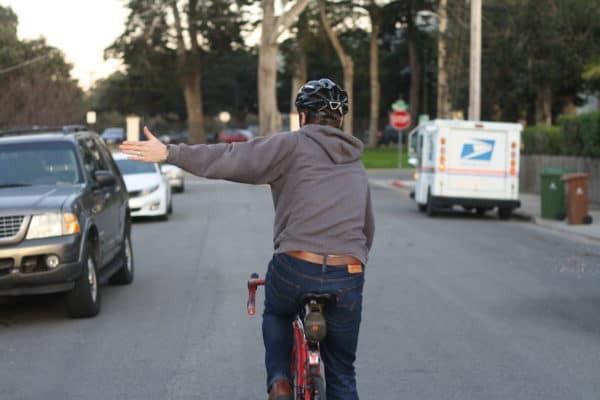 The following hand signals will let those in vehicles and other cyclists know whether you’re about to turn, stop, or slow down. One of the benefits of the car is that the driver is able to signal with turn blinkers to show other drivers which direction it is planning on going. Bikes don’t have blinkers or brake lights to tell the world what they plan on doing. All you have is your hands. Using hand signals is important to keep you and others safe. They are basic, but they can help prevent accidents from happening. You should always let other vehicles/cyclists know when you plan on turning or stopping. For those of you who are bike commuting in the United States, check your states law because many require that you use hand signals. Now without further ado, free up your hands so that you can learn the following signals! 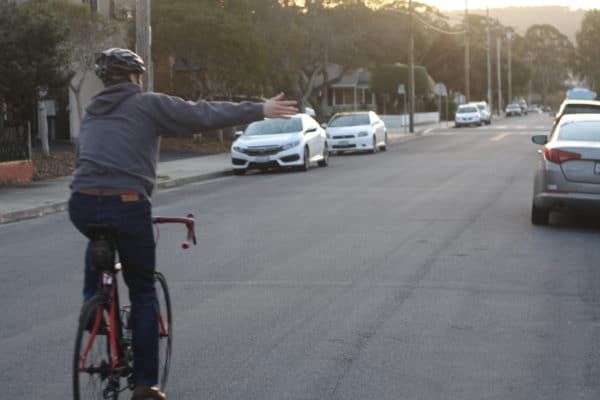 When you want to signal to cars or other cyclists that you’ll be taking a left turn – stick your left arm straight out to side with hand extended as you see in the photo above. Depending on the speed you’re going you’ll want to make this signal soon enough to give those behind you enough time to see your signal. Don’t make a turn signal in the last moment before you turn. This is also the signal you’ll want to make if you are changing lanes to the left. There are circumstances when you’ll need to move through traffic to get into a lane on the left. Perhaps you’re coming up to an intersection where you need to take a left turn, and you need to be in the left lane to do so. The first thing you need to do is look over your left shoulder to check for cars. Before you look over your should for cars make sure there are no potholes, obstacles, or vehicles in front of you. The only time I had a collision with a vehicle was when I went to change lanes. I looked over my shoulder while the car directly in front of me stopped. I went straight into the back of a minivan. Thankfully I wasn’t hurt. All this to say, make sure the coast in front of you is clear before looking over your shoulder. 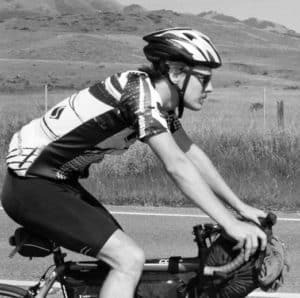 Next you’ll want to maintain your speed, keep your right hand on the handlebars, and pivot your hips so that you can look over your left shoulder. If the way is clear than you’ll make the signal and begin to change lanes. For a right turn you’ll want to do the opposite of the left turn hand signal. Stick your right arm straight out to the side with hand extended. This is the signal you’ll want to make if you are changing lanes to the right. Similar to the instructions for changing lanes to the left you’ll want to check for traffic before changing lanes. When you look ahead and realize you need to make a stop – extend your left arm downward at a right angle with your hand open. This is the most intuitive way to tell vehicles and cyclists behind you that you’re stopping. 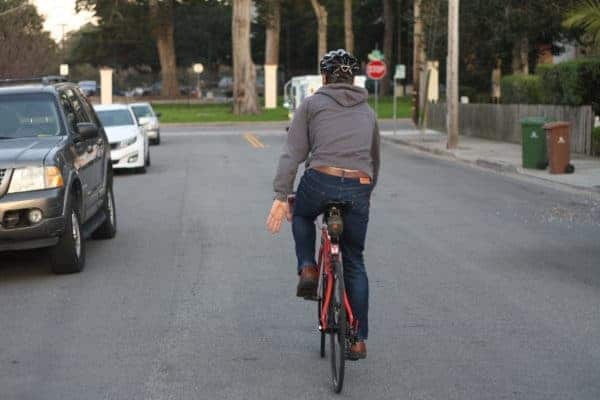 I have seen other cyclists use another hand signal for stop. Their method was to extend their left arm straight out, but bend it 90 degrees at the elbow so that their hand pointed down. It’s up to you which hand signal to choose from, but I prefer the one pictured above. I have been using for years while riding around busy streets with cars and cyclists, and it works well to signal to others that I plan on stopping. I would add that if there is another bicyclist close behind you it may be wise to yell out “stopping!” to alert them that you’re going to stop. It’s not uncommon for other cyclists to run each other. Similar to the signal for stopping except you’ll want to put your palm of your hand parallel to the ground. While your hand is parallel to the ground move it up and down to show that you are slowing down. I primarily use this one if there is a vehicle or cyclist close behind me to make sure they know I am slowing. 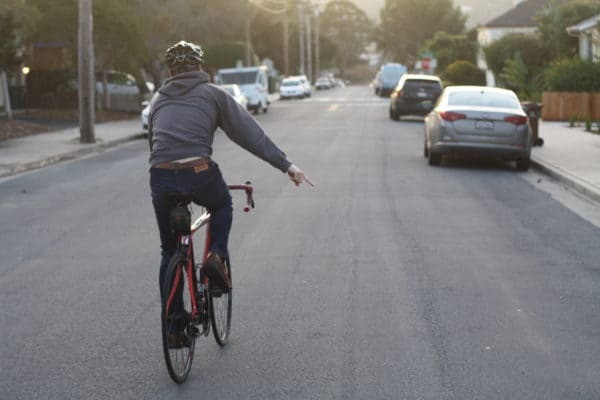 This hand signal is only to be used when there are other bike riders behind you. It is a courteous gesture to let them know that there is a hazard of some sorts on the road that they’ll want to avoid. For this signal you’ll extend your arm out and point to the side where the hazard is. Hazards may include, but not are limited to potholes, shards of glass, trash, rocks, diapers, dead animal, traffic cones, mysterious liquid, wire, and general litter. Basically if you see something on the road that you don’t want to ride over than you should use this signal to alert other cyclists behind. I rarely find myself having to use this signal on my commute as I don’t have other cyclists riding behind me, but I have used it often while riding with friends. It’s a good hand signal to know as a cyclist. I have met bike commuters who have an attitude of indifference towards traffic laws and hand signals. Sometimes this stems towards a feeling that cyclists are at odds with vehicles. Other times this attitude seems to come from the notion that bike riders are above the law. Whatever the reason for the attitude, I think it’s stupid. 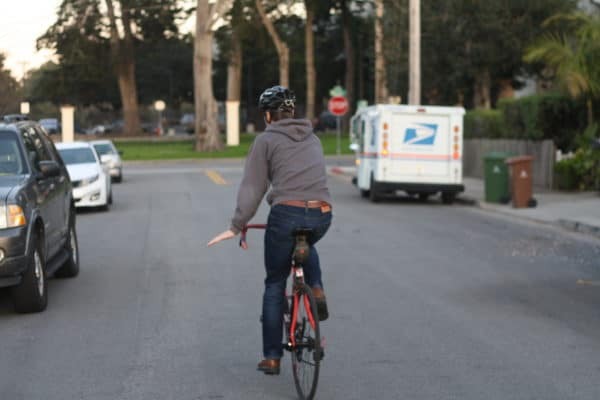 Do everyone a favor and use hand signals while riding your bike. Hand signals will keep you safer on the road. 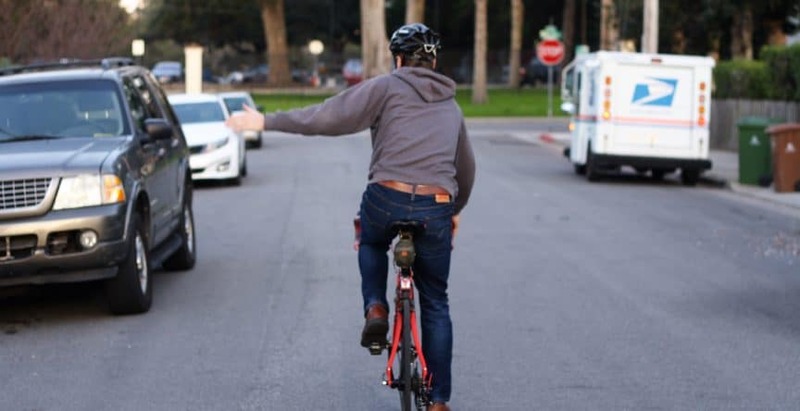 By using hand signals you’ll not only help those in vehicles know what you’re doing, but you won’t be adding fuel to the unnecessary us vs. them mentality between drivers and riders. When you use your hands you are doing your due diligence to keeping yourself and others safe on the road. I hope you found this article helpful! If we missed something and need to add it, please send us an email. 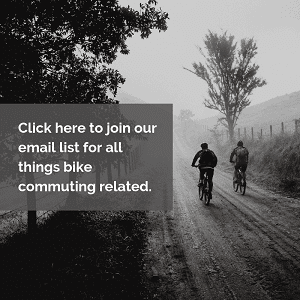 We really want to make the most helpful content for veteran and new bike commuters. 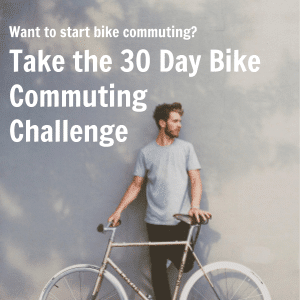 Enjoy your next bike ride!